Groupe Country US formé en 1935 d'abord sous le nom de "Carter Quartet", puis en 1936 en "Chuck Wagon Gang" et composé de Dad Carter (né le 25 septembre 1889, décédé le 28 avril 1963), Jim Carter (né le 10 août 1910, décédé en 1971), Rose Carter (née le 31 décembre 1915, décédée le 13 mai 1997), Anna Carter (née le 15 février 1917), Ruth Ellen Carter et Roy Carter. Le Chuck Wagon Gang a eu aussi comme membres : Eddie Carter, Bettye Carter, Alynn Billodeau, Ronnie Crittenden, William Howard Gordon , Patrick McKeehan, Patricia Neighbors, Ronnie Page, Harold Timmons, Debby Trusty, Howard Welborn & Greg Gordon. Although the Chuck Wagon Gang has been around since 1936 -- undergoing many personnel changes over the years -- its sound and devotion to old-fashioned gospel has remained much the same. Their greatest significance is that the band provides an important link between country music and traditional sacred songs of the South. The original incarnation of the Chuck Wagon Gang was made up of four members of the Carter family -- no relation to the Carter Family. They were Dad Carter (David Parker Carter), his son Jim (born Ernest), daughter Rose (born Rosa Lola), and his daughter Effie. Dad Carter was born in Kentucky, but was raised in Clay County, Texas. He was enrolled in a singing school there when he met Carrie Brooks, whom he married in 1909. They had eight children, and to support them, Carter worked for the Rock Island Railroad in 1927. At other times, he and the family also picked cotton. The band formed around 1935 after one of the children became deathly ill and the family was left destitute; for additional income, Dad Carter talked the management at station KFYO Lubbock into hiring him as a host for a daily radio program. 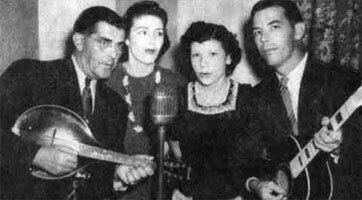 The original group was called the Carter Quartet, in which Dad sang tenor, Jim sang bass and played guitar, while Rose and Effie sang soprano and alto. They became popular and soon began earning $15 per week. 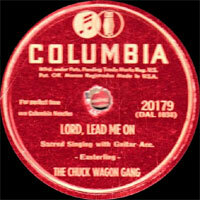 The following year, the Carters moved to WBAP and billed themselves as the Chuck Wagon Gang; they sang a variety of secular and sometimes sacred songs. 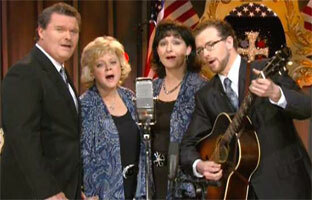 Their earliest recording session for ARC produced country singles, rather than gospel. As the years passed, they gradually became more gospel-oriented, and by the early '40s had switched over completely. In 1942, they spent a few months at a Tulsa radio station. The Chucks broke up for the duration of World War II. Afterward, they reunited and returned to WBAP, remaining primarily a radio band. 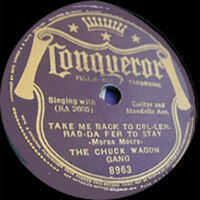 They began recording again in 1948 for Columbia. Two years later, Wally Fowler had them perform at one of his All-Night Singing Conventions in Augusta, Georgia; they then became a full-time touring band. In 1953, they underwent the first of many subsequent membership changes when Jim left and was replaced by Howard Gordon; he remained with the Chucks until his death in 1967. Another brother, Roy, also joined and sang bass in Jim's stead. Dad Carter retired in 1955 and was at first replaced by Eddie Carter. In the late '50s, non-family members such as Alynn Billodeau, Patrick McKeehan, Ronnie Page, and Ronnie Crittenden spent time with the Chuck Wagon Gang. Through it all, the band kept touring part-time and making records -- 408 masters by 1975. After three years of inactivity, the group began recording for the Copperfield label. 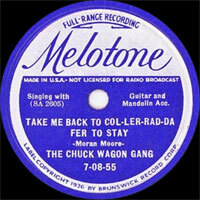 The Chuck Wagon Gang continued on in a similar vein until 1987, when they once again became a full-time band with new members joining the last of the Carters, Roy and his sister Ruth Ellen Yates. In 1984, Dad Carter (who had died in 1963) was posthumously inducted into the Gospel Music Hall of Fame. 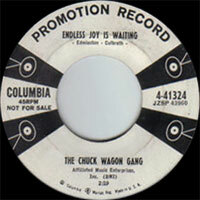 By the late '80s, the Chuck Wagon Gang had been named Gospel Artist or Group of the Year by Music City News five years in a row. In 1990, Bob Terrell published an authorized history of the group, The Chuck Wagon Gang: A Legend Lives On. 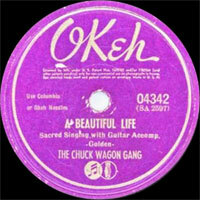 09/1938 78 t. OKEH 04342 (US) . Beautiful Life / Will You Meet Me Over Yonder? 07/1947 78 t. COLUMBIA 20285 (US) . Sunny South By The Sea / Take Me Back To Renfro Valley, Ky.
07/1947 78 t. COLUMBIA 37707 (US) . Sunny South By The Sea / Take Me Back To Renfro Valley, Ky.
1958 EP COLUMBIA B-2816 (US) In The Garden / Wonderful Savior / ? / ? 1983 ? SP COPPERFIELD 121 (US) . Sing Me A Going Home Song / ? 1983 ? SP COPPERFIELD 123 (US) . Someday Will Be Sunday All The Time / ?